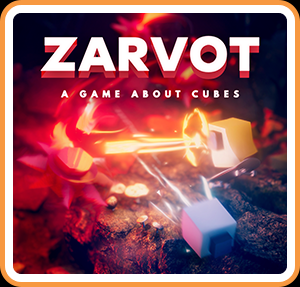 There's no shortage of games about blocks on Switch—see Flat Heroes or Death Squared, among others—but Zarvot, an isometric action title four years in the making, just might be the most unique. It's armed with a neat little four-player multiplayer mode and a series of wave-based arcade challenges, but its oddest feature is a brief, surreal solo campaign about anthropomorphic cubes. If you're partial to local party games and/or abstract storytelling, Zarvot might be worth trying. The game follows Charcoal and Mustard, two living, breathing cubes that resemble Daguerreotype cameras, who inhabit a world almost like our own. They rent apartments, take the metro back and forth, send text messages (Mustard even has an OKCubic account), and drink coffee. The world is almost like the real thing because the real-life environments are twisted or exaggerated slightly—they're more dreamlike dioramas than actual places—and because battling enemies called glasists seems to be as common as cell phones and cappuccino. Charcoal and Mustard want to make a present for their pal Red, who's celebrating a birthday. When the gift is destroyed, the cubic couple venture across twelve chapters to put the components back together again. Outwardly, the game tells a simple story of buddies piecing together a birthday gift, but the game is rich in symbolism and subtext. It hits on themes of friendship, depression, and loyalty. At times, it can get a little too cerebral and artsy for its own good, but in general it provokes some deep thoughts and feelings—and a few chuckles, thanks to Mustard, who speaks in internet shorthand. Regrettably, the level designs and action scenarios in the campaign aren't as thoughtful as the narrative. Charcoal, with Mustard in tow for some levels, moves through mostly-linear levels, clearing several mob rooms and finally facing an end boss. Although each environment is a visual treat (more on that later), and the cubes are sympathetic characters, there just aren't enough fun, engaging things to do in the campaign. The novelty of entering an open area, blasting bad guys, and leaving only when every glasist is dispatched dissipates after a while, and there aren't any interesting platforming or puzzle-solving situations to complement the fighting. That said, the actual mechanics of combat are smooth and enjoyable. Movement is fluid and tactile, and Charcoal’s moves—rapid-fire shot, charge shot, short-range melee attack, AoE strike, jump, and dash—are varied and comprehensible enough for some flashy combos. Deploying these attacks and defensive maneuvers against the game's surreal bosses is the highlight of the campaign. Each boss is an oddity—a metal duck, a rogue banana, or a milk carton that's gone very, very bad, to name a few—with unique attack patterns and significant offensive firepower. After the 3-hour campaign is complete (you can always replay individual levels for better ranks), Versus, the best mode of the bunch, awaits. Here, up to four local players can compete in five game modes on 19 destructible maps. You'll find standards like Elimination and Death Match, alongside Vox Control (collect 30 sushi to win), Sumo (knock opponents from the ring), and the Switch-exclusive Joy-Vot, an asymmetrical mode where one player summons glasists to topple the remaining cubic players. Although this suite of multiplayer types is the highlight of Zarvot, it's not worth a recommendation on its own. Missing customization options (and bots) and a general lack of tactical depth means it doesn't have much staying power. In addition to competitive multiplayer, Zarvot sports nine wave-based challenge levels—basically a simplified horde mode. These levels, which are unlocked in the campaign, send dozens of glasists at the player, who must destroy them all in successive waves. These are a fine diversion from the meatier modes, and nice practice for battles with friends. Audiovisually, Zarvot would be great, if not for one bizarre technical decision. The game's moody, ambient soundtrack is strong, its lighting, textures, and water effects impressive, and its inclusion of real-world props and environments—à la Pikmin—extraordinary, but its filmmaking technique, whereby large sections of the on-screen action are blurry or out-of-focus, is off-putting and distracting. With strong boss battles, a cerebral story, and some amusing local multiplayer modes, Zarvot is a fairly good action/party game, particularly for players interested in narrative, couch competition, or both. However, a repetitive campaign, lack of customization options, and, in general, a low tactical ceiling mean it probably won't find a place in your regular rotation. This review is based on a digital copy of Zarvot for the NS, provided by the publisher.